Nick Clegg has come under attack over political donations - as the Lib Dems say he is being "smeared" ahead of the second TV debate. Mr Clegg, whose party enjoyed a poll boost over the last week, later published papers which the party said showed he had done "nothing wrong". Lord Mandelson accused the Tories of "pushing the smear button" - something the Conservatives said was "nonsense". Four newspapers attacked Mr Clegg on Thursday over policies and donations. Mr Clegg, Gordon Brown and David Cameron are preparing for the debate on Sky News from 2000 BST. 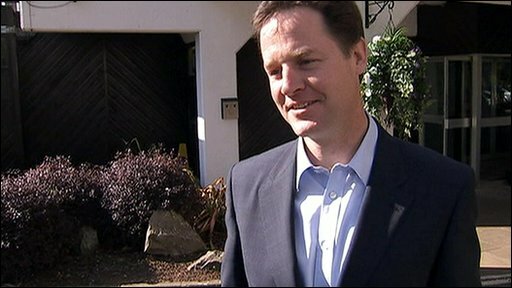 On Thursday night Mr Clegg released copies of his bank statements and other paperwork in an attempt to clear up the row. The figures released by the party show donations from three private donors amounting to £19,690 were paid into Mr Clegg's account between January 2006 and January 2008. But according to the Lib Dems' figures Mr Clegg paid £20,437.30 into party coffers between March 2006 and February 2008 for staffing costs. Earlier the Daily Telegraph reported Mr Clegg received up to £250 a month from three businessmen in 2006, paid into his bank account. The Daily Mail led on comments he made in 2002 about Anglo-German relations under the headline "Nick Clegg in Nazi Slur on Britain". He was also attacked in The Sun and the Daily Express. Mr Clegg, whose popularity was on a par with Winston Churchill according to one headline last week, said: "I have done nothing wrong." "There are a lot of people who want to stop change, of course. I think I must be the only politician in the space of a week to go from Churchill to Nazi." He added: "I hope people won't be bullied, be frightened into not choosing something different." Mr Clegg received some support from Labour's Lord Mandelson, who told BBC Radio 4's World at One: "It's cheap and rather squalid with no place in this election." He suggested the stories were "straight out of the Tory party dirty tricks manual" - something the Conservatives said was "nonsense". Former Tory foreign secretary Sir Malcolm Rifkind described the comments as "vintage Mandelson". But Foreign Secretary David Miliband also said the newspaper coverage suggested "deep panic in the Tory ranks and in Tory supporting newspapers". BBC News Channel chief political correspondent Laura Kuenssberg said it was a clear tactic by the Labour Party to show sympathy for Mr Clegg and try to suggest the Conservatives have been rattled by his success in the polls. The surge for the Lib Dems has increased speculation about a hung parliament - and whether the third biggest party would back Labour, which is currently coming third in the polls. Lib Dem home affairs spokesman Chris Huhne told BBC Radio 4's Today programme the stories in the newspapers were "smears" adding: "Every single Conservative newspaper has a splash attacking Nick - I wonder why." HOW DID FIRST DEBATE GO? Mr Miliband rejected suggestions he could be installed as prime minister, if the Lib Dems demanded it in return for their support in a hung Parliament. He said: "We have chosen our party leader. "We are not going to have Nick Clegg telling us who should be our party leader. "Gordon Brown is our party leader. That's the end of the story." The Daily Telegraph said Mr Clegg received payments from Ian Wright, a senior executive at drinks firm Diageo; Neil Sherlock, the head of public affairs at accountants KPMG; and Michael Young, a former gold-mining executive - paid into his personal bank account. The donations were registered with the Electoral Commission and with the Parliamentary Register of Members Interests at the time they were given. Mr Clegg also hinted in an interview with the Independent that Labour's promised referendum on switching from a first-past-the-post voting system, to the "alternative vote" (AV) would not be enough to win Lib Dem backing in a hung parliament. He said the system proposed was "a baby step in the right direction", and said he would not settle for "a miserable little compromise thrashed out by the Labour Party". • The second prime ministerial TV debate is being shown simultaneously on Sky News, Sky 3, and the BBC News Channel from 2000 BST to 2130 BST. It will also be streamed live on the BBC News website, and broadcast on BBC Radio 4. It will then be re-run on BBC Two, starting at 2330 BST.